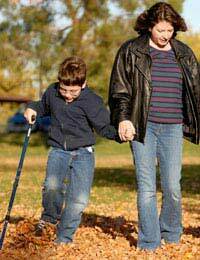 Caring for someone with cerebral palsy, especially a child, can be a difficult experience. It can also, however, be immensely rewarding. In this case study, Simon and Claire, married with three children, explain how they care for their four-year-old daughter Emma, who was diagnosed with cerebral palsy shortly after she was born. Cerebral Palsy is the term used by the medical profession to describe a set of neurological conditions that affect both a person’s brain and also their nervous system. These conditions are caused by damage to the brain, which occurs either to the unborn child or takes place shortly after birth. In the UK, it is estimated that one out of every 500 children are born with cerebral palsy. The precise symptoms of cerebral palsy vary from child to child, but usually involve an impairment of the child’s movement and general co-ordination. This means that while some children can have difficulty walking, others are profoundly disabled and require round-the-clock care. “We mentioned it to a nurse during a home visit and she explained that this could be something called Hypotonia – a lack of muscle tone that is often associated with cerebral palsy. The doctors explained that cerebral palsy is not a progressive condition, which means that it will not worsen as Emma gets older. They also pointed out, however, that over time - a number of associated conditions could materialise in later life. These included learning difficulties, epilepsy, poor eyesight and hearing, speech difficulties, poor growth, incontinence and scoliosis (curving of the spine). The hospital pointed out that while a confident diagnosis of cerebral palsy can be made while the child is still at the infant stage, they stressed that the type and severity of Emma’s cerebral palsy would not be able to be fully assessed until she was perhaps four or five years old. Claire says: “We had no idea how many different types of cerebral palsy categories there were, and it is still too early to determine which one Emma falls into. At the moment the doctors suspect that Emma has Athetoid (also known as dyskinetic) cerebral palsy. This means that she will likely experience not only hypotonia but also hypertonia. Once Simon and Claire were told of Emma’s condition, and the possible future conditions that were associated with her cerebral palsy, the family were assigned a team of health professionals to help care for Emma. This team included an appointed paediatrician, a health visitor and social worker, a physiotherapist who’s job it was to work on Emma’s muscle strength and a speech therapist. Simon says “It was amazing to think that these people would all be working on Emma’s condition, and we were told that as she got older the team would also include an occupational therapist to help her perform daily tasks, an incontinence adviser and also an educational psychologist to assist with her learning. Simon and Claire know that there is no cure for Emma’s cerebral palsy, but have drawn strength from knowing that there are a vast range of treatments designed to help alleviate her symptoms and allow her to live with her condition, and also prosper. The treatment of cerebral palsy has come far in a relatively short period of time: fifty years ago it was rare for children with the condition to survive into adulthood. Now, Emma stands a good chance of living a long and productive life.